Use this as the starting point for your first assignment. Make a series of between 6 and 12 photographs that responds to the concept of the ‘Square Mile’. Use this as an opportunity to take a fresh and experimental look at your surroundings. You may wish to re-trace your steps to places that you know very well, examining how they might have changed; or, particularly if you’re in a new environment, you may wish to use photography to explore your surroundings and meet some of the people around you. You may wish to explore the concept of Y Filltir Sgwâr further, or you may deviate from this. Decide whether to focus on urban space or the natural environment. You should try to make your final set of photographs ‘sit’ together as a series. Don’t necessarily think about making a number of individual pictures, but rather a set of photographs that complement one another and collectively communicate your idea. Title your photographs or write short captions if you feel this is appropriate and would benefit the viewer. Until 2007 I don’t think I really called anywhere ‘home’. As a child I grew up in the UK, South Africa and Canada, living in multiple places in each country. University was a different house each year, punctuated by time spent away on placements. Even when I started work in London I didn’t settle in any one place for more than 2 or 3 years. The concept of my Square Mile is therefore centered on Pixham in Surrey. This small community on the edge of Dorking is the first place I have truly felt at home. It has been for over 10 years now. Before moving here I lived in busy, crowded places. Pixham borders land which is largely National Trust and covered by hills and well-established woodland. Coming home from work, stepping off the train is like being released from captivity. Box Hill dominates the scene, and a short walk takes you past the river and puts you deep in quiet woods. This is the essence of my Square Mile: leaving behind my working life and stepping into a more tranquil world. I found Dan Holdsworth’s work interesting, though many of the images were not to my taste aesthetically. Those I especially liked were the Infinite Picture and Hyperborea sets. I suspect I was responding to his use of long exposures, and the sense of silence and space they seem to give. This is something I would like to recreate in my Square Mile images. Tom Hunter’s galleries are full of images which are clearly very personal in nature and convey the deep understanding of a place and events which only comes with being immersed within them for years. There are several things which have supplied inspiration over the past weeks, and I hope to have incorporated them into my Square Mile. Two in particular stand out. ‘Le Flou’ was a contentious concept in the early days of photography when it was struggling to be accepted as an art form. Literally translated as ‘blur’, I like the idea that by sacrificing some details we are better able to focus attention on a subject. That sacrifice may be achieved through focus, exposure or time. Dan Holdsworth’s ‘California’, ‘Autopia’ and ‘Machine For Living’ are examples of non-places. In my research of this topic I found that almost without exception photographers have turned to images of urban, built environments – the anthropological. Non-places hold a fascination for me and I’m sure I will make use of such environments as well, but I also want to search out examples in more natural locations. There were two competing ideas for this assignment. Both based on exploring contrasts between the busyness of the town of Dorking and the tranquility of the surrounding countryside. The first idea was to define a square mile as a strip, half a mile wide and two miles long. This would then have acted as a cross-section through the town, starting and ending on the hills either side. The second idea was to centre a true square mile on the lookout point of Salomons Memorial on Box Hill, however that would have left home sitting on the very edge and forced me to leave out many interesting scenes. And whilst the view from Box Hill is beautiful and can be spectacular, it is at the end of the day just a view. I have therefore taken a very straight interpretation and dropped the square mile right around my home. The attached contact sheets are a representative sample of 140 photographs shot as part of this assignment. There are many more, but that should be sufficient! I have presented my final selection of 12 images sequentially below. The intent of the sequencing is to link through the use of compositional elements or subjects, with a general flow from urban to rural. I’ve also presented each with a short text after this initial sequence. This is a shot which I have been meaning to go back and take properly – this effort was quickly taken on my G5X compact without a tripod. 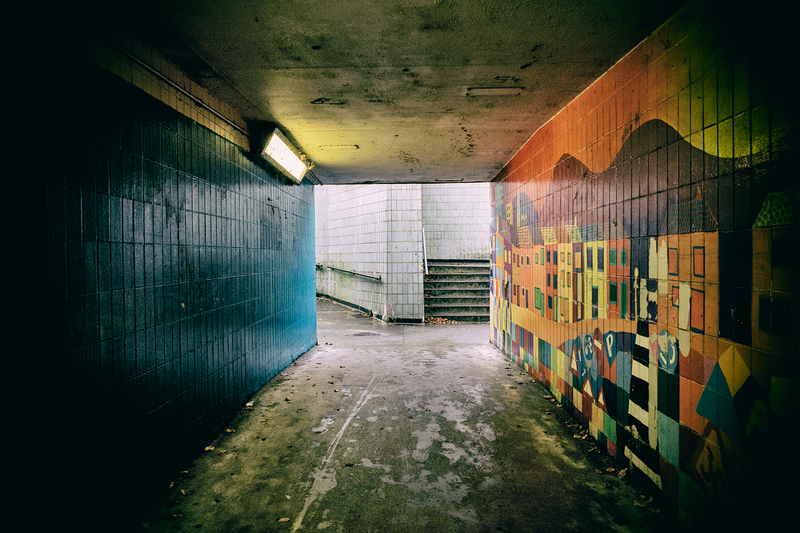 Like the following daytime image from inside the underpass I like this for the strong graphic elements and colours. It was raining, which has added much-needed reflections. Were I to go back to this, I’d need similar conditions. I’d also use a longer exposure to accentuate movement in the traffic, and perhaps get a friend to provide a human element. Again, I’ve chosen this in my final cut in large part because of the graphic elements. In particular I like the strong leading lines, different blocks of colour, and the split in direction contained in the central square. The wet shoe prints and track left by bicycle tyres adds interest, and the leaves reference the time of year without there being any clues from the outside world. For continuity with the first image I’d like to recreate this shot at night. The bridge at the end of Lincoln Road carries the railway line south from Dorking. Walking through here is like the final step on the escape from work, and I’ve framed the image to try to represent this. The framing is also a link to the previous image from inside the underpass. 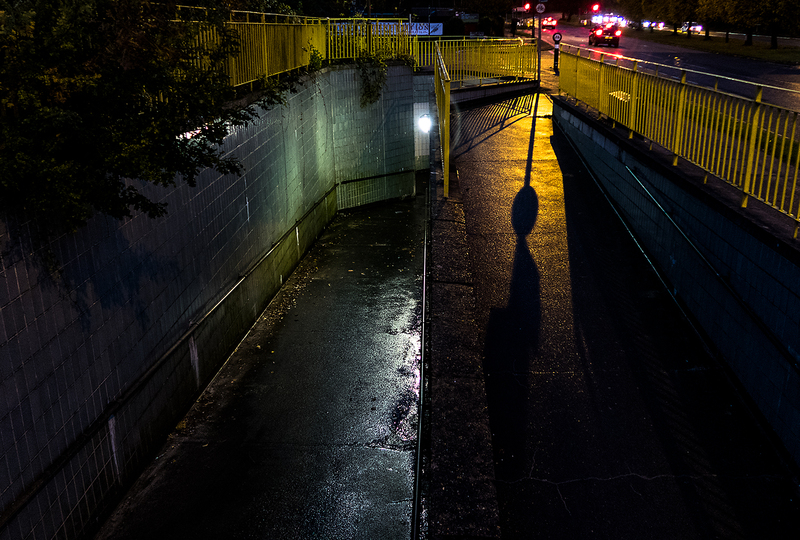 With the editing I wanted to emphasize the light elements within the shadowy areas, enhance edges to push the three dimensionality and generally create a sense that you can step forward from a grimy, urban environment into something green and a little wild. There are certainly areas to be improved. Time pressures meant I was using my G5X and it’s 1” sensor rather than the usual 70D, and perhaps more importantly no tripod. The editing has added some fringing around the patch of sky. Separating Dorking from where I live in Pixham is an area which used to be allotments and is now overgrown and abandoned. The railway bridge on Lincoln Road is in the background. I think this is the image in my final selection that I’m least happy with. In large part I think that stems from having been grabbed spontaneously (as the person walked under the bridge giving a nice silhouette) a result of which I have had to crop and thereby lost detail. To compensate I’ve gone black and white, enhanced the graininess, and tried for a film noir ambience. 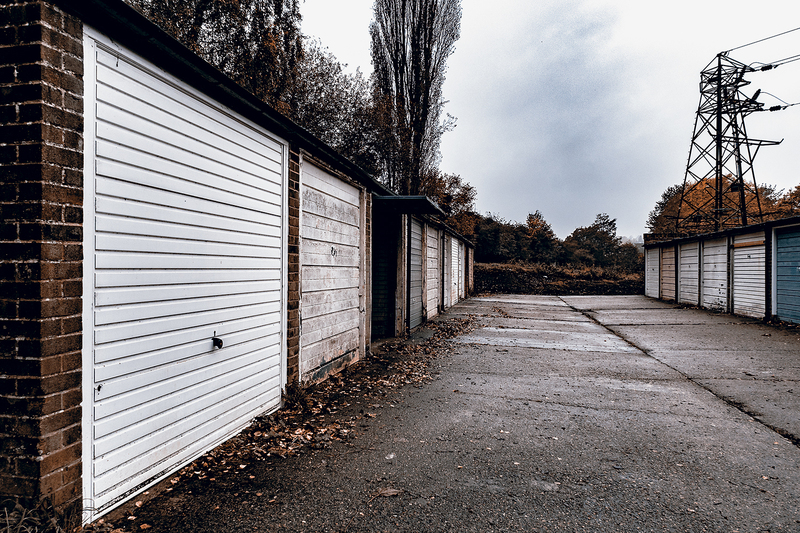 These slightly scruffy garages are on the other side of the waste ground from Lincoln Road and belong to a road of 1930s maisonettes which for the most part are beautifully kept. I like this photograph for the graphic lines, the contrast between trees and pylon, the scatter of Autumn leaves. There is variation in the style and colour of the doors when you might have expected them to be more uniform. There’s a general damp, windswept, Winter is coming feel. I’ve dulled the colour somewhat in editing, and enhanced yellows and oranges slightly. The patch of sky had little detail, so I’ve burned it just a little so it’s not entirely featureless. Again, I was using the G5X without a tripod. The softness of the lens edge at the wide end of the zoom and aperture range is evident towards the corners. I have had some fun with this image. It’s the gate which is supposed to stop unauthorized people from using a bridge over the River Mole owned by Thames Water. The construction has a very industrial, Mad Max look to it, and the damage implies that something may have escaped. Helpfully the bend in the sign means that reflected light obscures ‘keep’ to a degree. 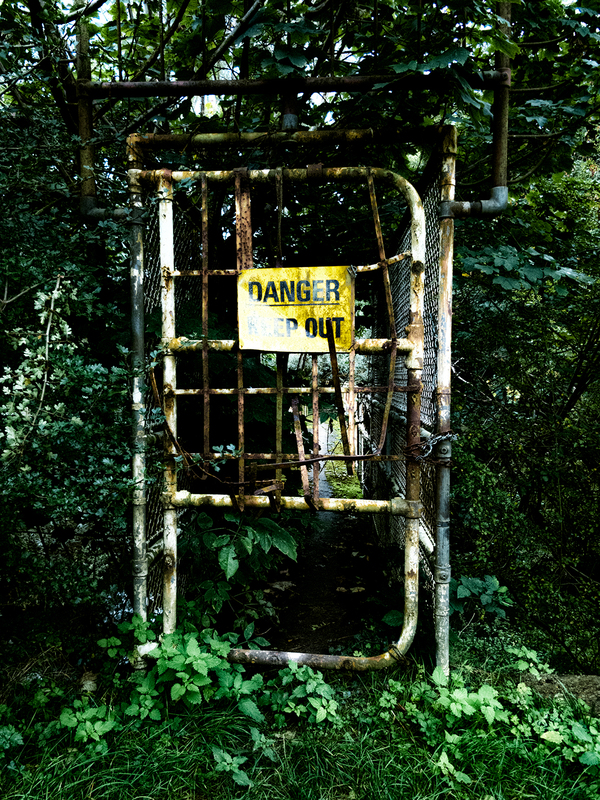 I have edited this in a way which washes out the colours whilst trying to retain the yellow of the warning sign, the intent being to create a sort of horror film, nightmare ambience. As far as I’m aware this bridge provides access from the farmland on one side of the river to the Thames Water treatment plant on the other. I have no idea why it’s needed and the bridge itself appears not to have been used for years. I took inspiration directly from Toshio Shibata’s Red Bridge for this image. I like the way it appears to hang there without visible supports, and is almost swamped by the trees around it. I also love the way the water is revealed primarily by the reflections. The only way to get this viewing angle for the bridge is where the river bank has collapsed on the outside of a downstream bend. Unfortunately it’s not possible to get further out to lose the distracting foliage on the left. Maybe next time I’ll put wellies on and stand in the river. The outflow from the Thames Water works is tucked away behind trees on the river bank. 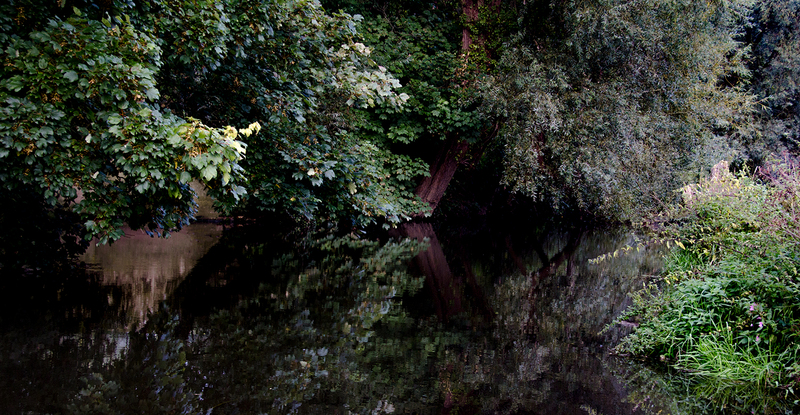 The concrete wall is visible here as a reflection, mirroring the leaning tree trunk further downstream. I like this similar-yet-different juxtaposition between the man-made wall and tree. 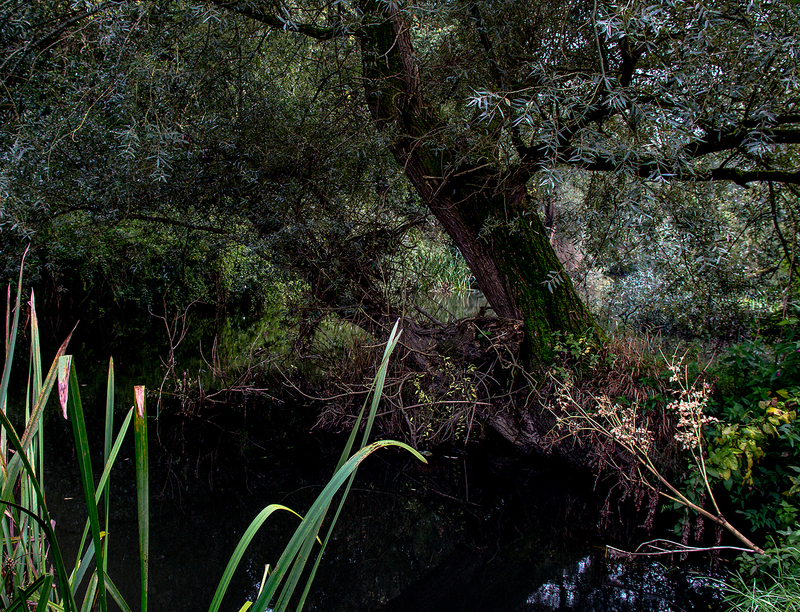 In completing this assignment I’ve also come to realise that I love finding scenes that combine dense foliage and still, dark, reflective water. Editing was largely restricted to removing some floating leaves. The East-West railway line crosses the River Mole on a high brick viaduct. 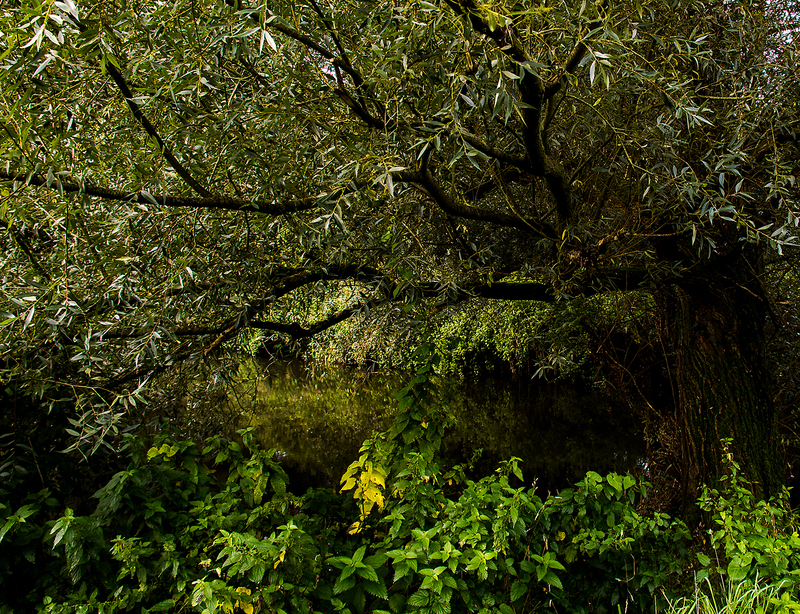 On one side it’s quite open but, on the other, trees growing up the banks leave it partially hidden. That’s accentuated by the growth of ivy across the top, and rainwater has leached lime from the mortar. 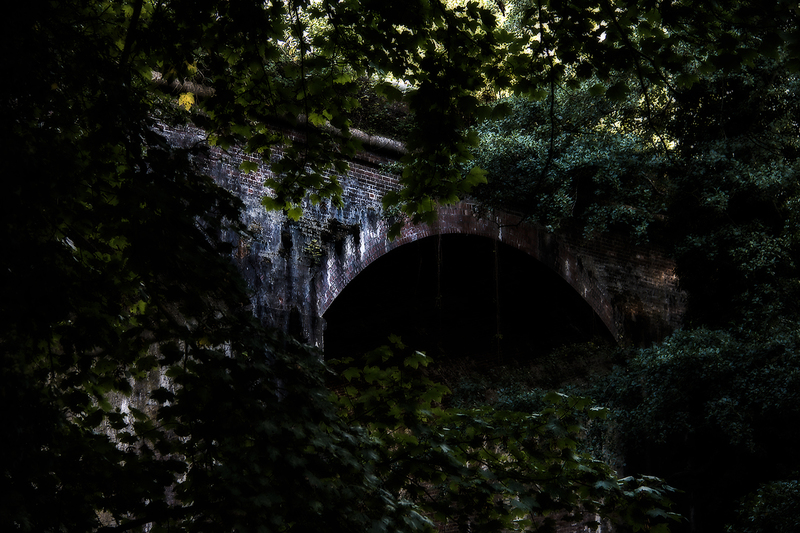 All this results in the Victorian viaduct looking like a lost Roman ruin in the woods, something I have tried to capture in this photograph. There is not a lot of light beneath the trees, and the exposure time resulted in some movement in the foliage. I chose to slightly soften the sharpness to make use of that and accentuate the contrast with the brickwork. 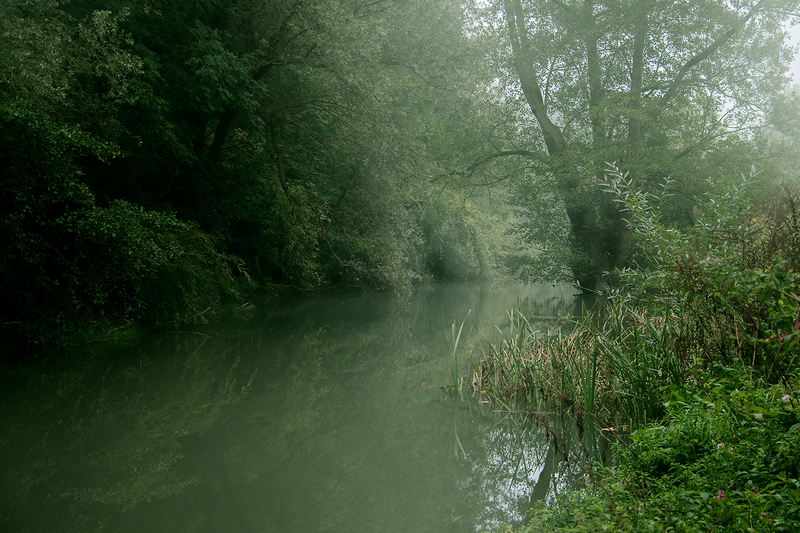 Both of these images continue the theme of dense foliage, undergrowth, trees and still, reflective water. Both were under-exposed to retain detail in the brighter areas, with some editing to then bring out shadow detail. I think the dimness of the light helps to accentuate the mood of stillness. Quiet Place 1 was flipped horizontally to provide a connection to the arch of the viaduct in the previous photograph. This was taken early one morning when I thought I might have a chance to photograph the viaduct in thick fog, but by the time I got my act together and walked down the river it had started to lift. 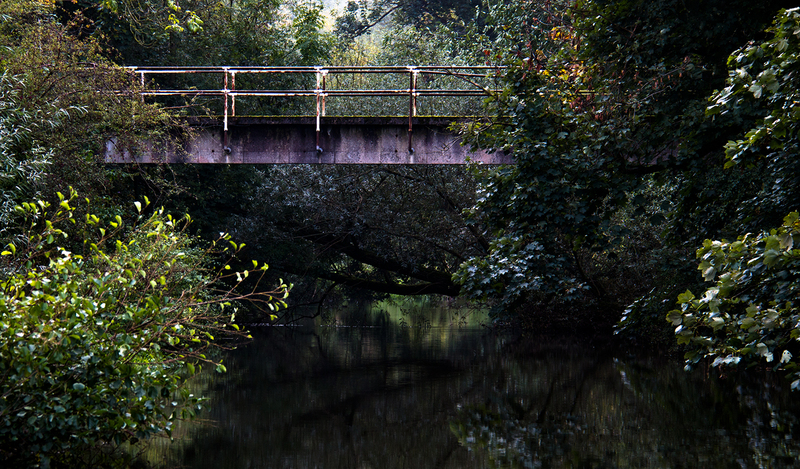 The soft light, plus the silt in the river from the previous night’s rain, did however produce this almost monochrome green scene. Editing consisted of removing a couple of distracting floating leaves and toning down the highlights in the patches sky. Overall I am happy with my final selection for Assignment 1. I know that I’ve learned a great deal and have certainly been driven to develop themes and approaches I’ve only touched on previously. Equally I have identified many more things that need to be worked on. Using a tripod is probably at the top of that list, though doing so seems to attract attention and that is something I don’t particularly enjoy! I may need to tone down some of the edits, but it’s fun experimenting. That’s been a treat to read. I particularly like the underpass and the garages. They are not places that I would seek out, but you have made these photos quite beautiful. I will follow your lead and seek out some non places to shoot. I like what you’ve done to the sky in your garages as well. Thank you Richard. Before this course I doubt I would have sought out such seemingly mundane locations either. Being encouraged/stimulated to see the potential for composition in these sort of every day scenes has been one of the greatest benefits of this course to me so far. I have walked past those garages thousands of times and never once considered them to be photogenic. I’ve also notice the terrible lines on the x12 contact sheet, must try doing that one again! I get those lines on my contacts sheets as well. Not sure why. I had time for a quick bit of research. Seems to be to do with the way the PDFs are put together but Lightroom. The lines are not visible in the PDF itself, but some sort of artifact is there and interpreted by WordPress into the lines. Will need to look for a solution! Regards, Mike. I have also experienced the ‘seeing things that I previously walked past’ phenomena. The course is opening my eyes to the possibilities. I particularly like the way in which you have captured some of these ‘previously walked past’ views. I think they are atmospheric in their own right, and then also a useful archive of your locality. And I like ‘Waste Ground’! Good work. Thank you David, particularly your vote of confidence in ‘Waste Ground’! I really wanted to include it as a link between Lincoln Road and the Swan Mill Gardens garages, but worried about it’s quality. What a wonderful series you have put together. I particularly like your choice a dark colour pallet. It seems to imply a peaceful location. I’m curious about your use of monochrome in the wast ground image. I appreciate it marks a change in location but had you tried it in colour? I get the feeling it would fit in with the rest of series if was a colour image. Still, a great interpretation of the square mile! I did have several other B&W images in contention for the final 12, and the viaduct photograph was nearly one of them. I may revisit that decision and include it after all, as you are quite right in suggesting that a single B&W may spoil the flow. 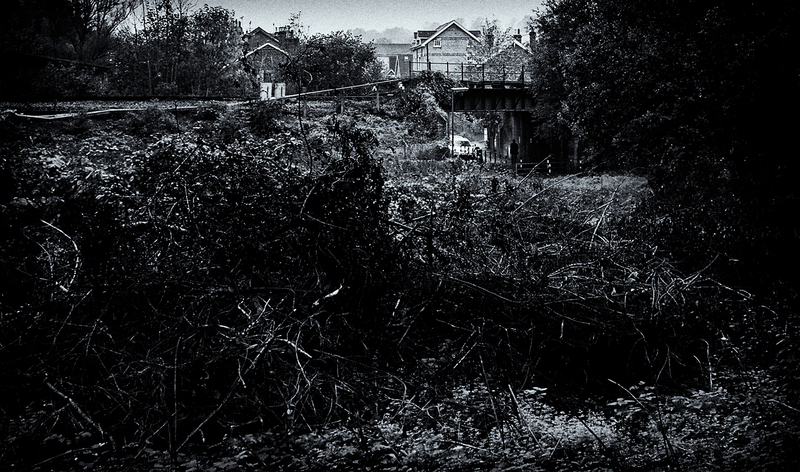 The alternative, including Waste Ground in colour, is one I tried but the colour seems to cause the bridge area and the silhouetted person to lose their impact. Editing 12 shots into a sequence has probably been more of a challenge than taking them in the first place! You have very few people in your complete set and none at all that I can see in your selected 12. Was this deliberate? 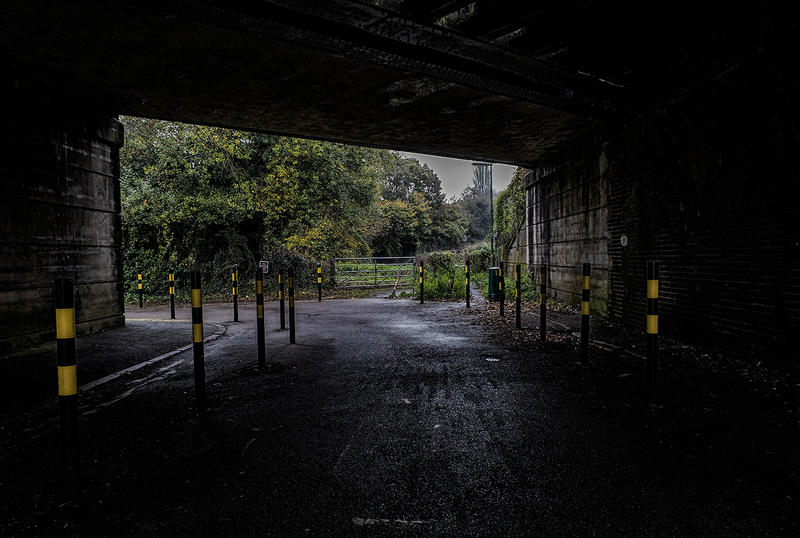 The full set is dominated by ‘pastoral’ and peaceful photos apart from your underpasses!! Interesting. I know Dorking and Box Hill (lived in Leatherhead once) so I know the district and I agree, it is surprisingly rural. So are the underpasses at Dorking Station? I am about to start on my Square Mile and have got lots of ideas from your presentation. Thanks. Thanks for your comments! The lack of people in most of the shots was a deliberate choice, except for the Underpasses and Lincoln Road. They are not the sort of locations I’d be comfortable photographing random strangers – when quiet I doubt many random strangers would be comfortable either. I do have some volunteers to take part but they’ve been unavailable and I couldn’t wait any longer. I plan to re-shoot those at some point for a Learning Log exercise. I was also surprised about the mix of subject types in the full set. Strangely, the more urban scenes, which I am not so familiar with as subjects, were the easiest to photograph and required few attempts. I’ve always considered myself a landscape photographer and those were surprisingly not so easy! The underpass is indeed at the station, running under the A24/Deepdene Avenue. I am coming late to this viewing, with only intermittent connection in Sutherland. I have very much enjoyed reading your work and seeing your photographs. Having commuted to and from London for many years I certainly understand the feeling of release as you step off the train each day. I like the connectedness you achieve. All very well presented. I agreee with the comment about only having a single monochrome image. I am not sure that including people is necessary. I feel as though I am walking through your eyes and that you simply did not meet anyone! Really good work. Thank you for sharing. Thank you Sarah. I have had some very useful feedback on this assignment and common theme is that single B&W. I will be revisiting it and trying to get the same feel will more use of colour – though still muted. I hope you’re enjoying Sutherland, my distant ancestors were from that area, though at the time I suspect they wouldn’t have been very friendly! Hi Mike, an absolutely wonderful assignment. My two top favourites are the underpass. Wow! Truly breathtaking. I love the stillness and peacefulness that your images have. Shadows, reflections, the play of light and colours is absolutely amazing and it reflects all the learnings from the coursework that led up to this assignment. You must be proud. Great work. My best wishes. Your contact sheets have some wonderful images as well and especially on a crooked neck. 🙂 may I suggest creating contact sheets with proper alignment? Thank you Archna – and I appreciate your point about the contact sheets. I’ve learned that I need to take as much care over those as I do the final selection! Regards, Mike. Thanks Mike – there were such wonderful images and its a must that everyone sees it. I have noticed that people tend to overlook stuff they have to make an effort to see. By the way, I meant orientation, not alignment, sorry!! !